Welcome to our first Blog posting. 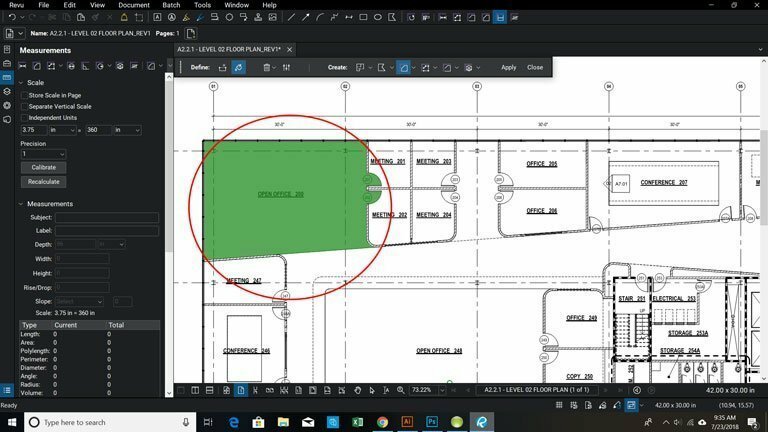 In this blog series, we will be discussing a number of topics ranging from tips and tricks for Bluebeam Revu and Primavera P6, to rising industry trends for AEC professionals and project managers. We are excited to share our knowledge; please subscribe to our blog and be the first to read our weekly postings! 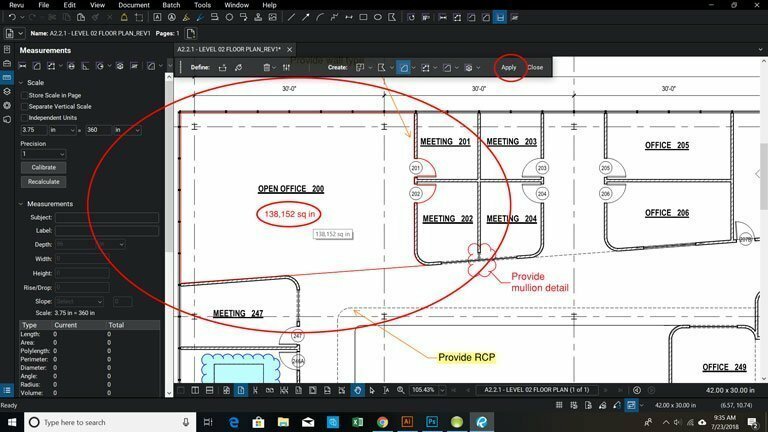 For this first entry, let’s explore Bluebeam Revu 2018 and how to properly calibrate the measurement tool and use measurement markups. In this example, I am using Revu eXtreme 2018 and running it on 64 bit Windows 10 Home Edition. I have also configured my own profile, so if you are following along you may be seeing a slightly different user interface. 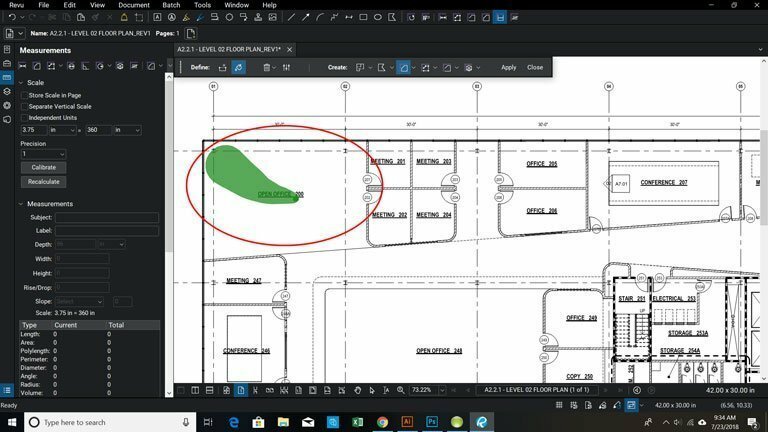 In order to work with measurement markups, you need to be marking up a PDF with an architectural drawing drawn to scale that already includes at least one measurement as a reference. In the drawing in my example below I have circled in red the measurement I’ll be referencing. 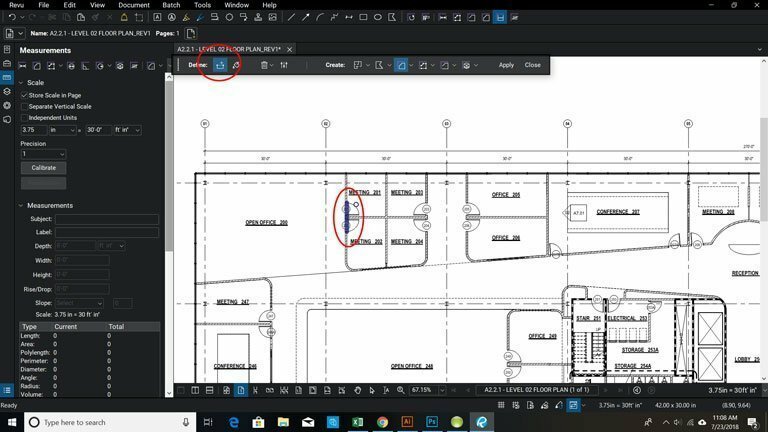 To access measurement markups, either click on the measurements panel access tab, or if you have configured your profile to include the measurement toolset in your toolbar, you may access them there. Both are circled in red. Next, you will need to calibrate your page. 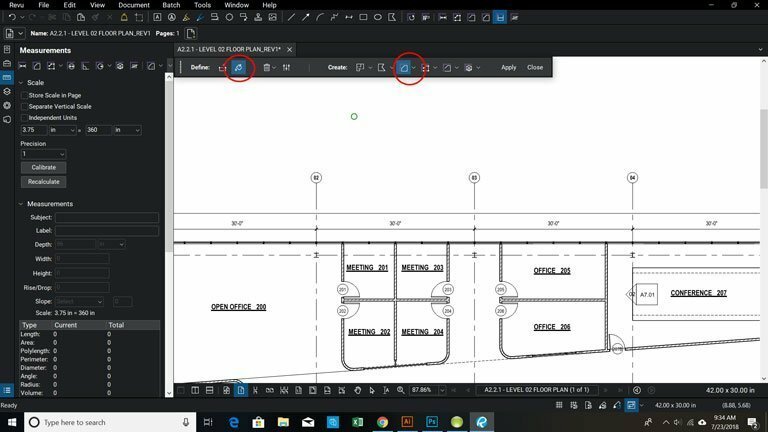 Below I have circled the calibrate button on the toolbar and on the panel access menu. A dialogue box will open asking you to calibrate the measurement tool by selecting two points on the page. For this example I already have a measurement included in my drawing telling me this wall is 30 feet. You will want to find a measurement like this, and click on both ends of the line after selecting the calibrate option. A dialogue box will open asking you to enter the length of the the line in question. In the dialogue box, enter the length of the line as it appears on the page. 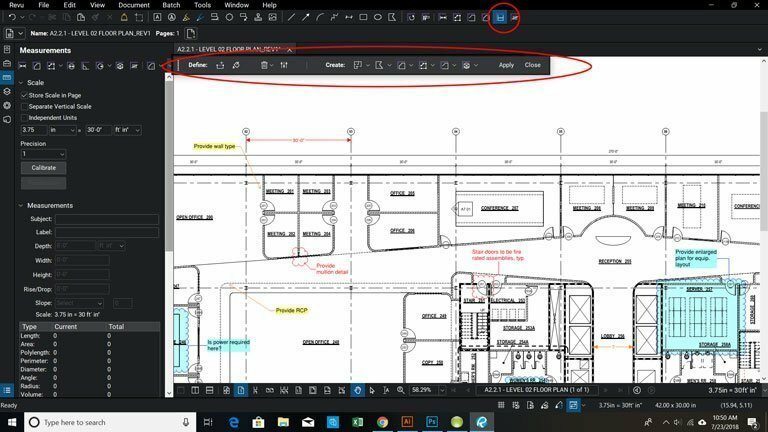 You also have the option to store the scale in the page so you don’t have to calibrate every time you open the software, and apply to all pages in case you are working on drawings that happen to be the same scale. After clicking ‘OK,’ your page should be calibrated, which you can see circled in red in the panel access menu. Before I start making measurements I always like to do a test to make sure my page was calibrated accurately and that I didn’t click outside of the line or enter wrong information. This test is also a good example of a basic measurement markup. From the measurement toolset on your toolbar, select the length option for the measurement tool. Just like calibrating the page, select two points to make a measurement. After selecting two points, Revu will generate the measurement based on your calibration. As you can see, the measurement matches the original reference. We can now look at more complex measurement tool options. It is also worth mentioning that you should be getting used to using the escape key (Esc) to turn off measurement options. Trust me this will save you a headache. The measurement tool is very powerful and can measure length, perimeter, area, and volume. 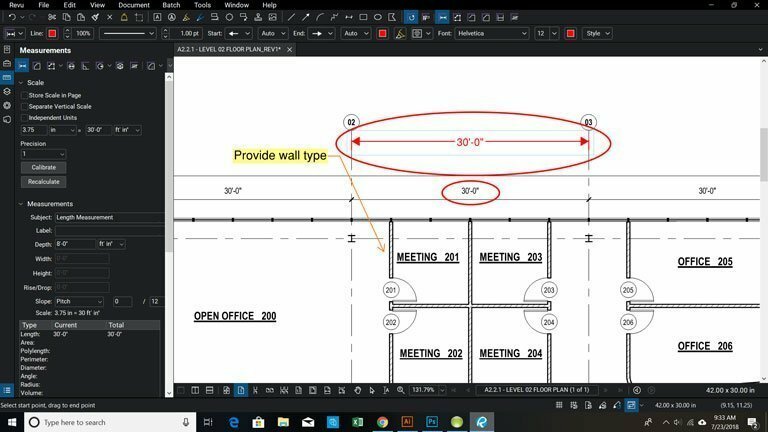 With more complex measurement tool options like calculating the area of a given space, you can click on points along the perimeter, converting lines to arcs when needed. This is definitely a viable option, however, there’s an option called Dynamic Fill which speeds up this process considerably and removes a lot of tedious steps. To access Dynamic Fill, click on the option in the measurement toolset and the Dynamic Fill toolbar will appear. Next you’ll want to find a closed space on your drawing. If you have a space that is not closed, you can select the ‘create boundary option’ (circled in red below) and select two or more points where the space is open. Below I have selected two points to close my space and then I pressed enter to apply. The boundary will only be generated after you press enter; if you don’t Revu will think you want to add more points to the boundary. 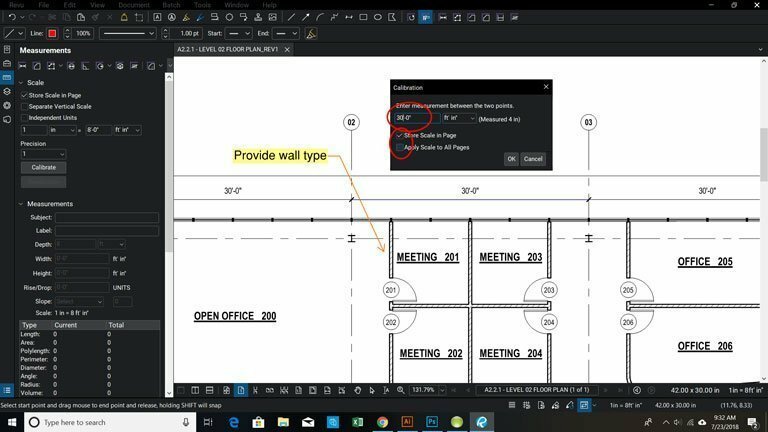 To calculate the area of a space using Dynamic Fill, click on the fill option and area measurement option. Your cursor will become a small green circle. Click and drag anywhere in the closed space. A green color will literally pour out of your cursor highlighting the closed space. Make sure to continue holding until the space is filled. Once the space is filled you can stop holding. Make sure not to drag the cursor outside of the perimeter of the space or you’ll need to re-do this process. 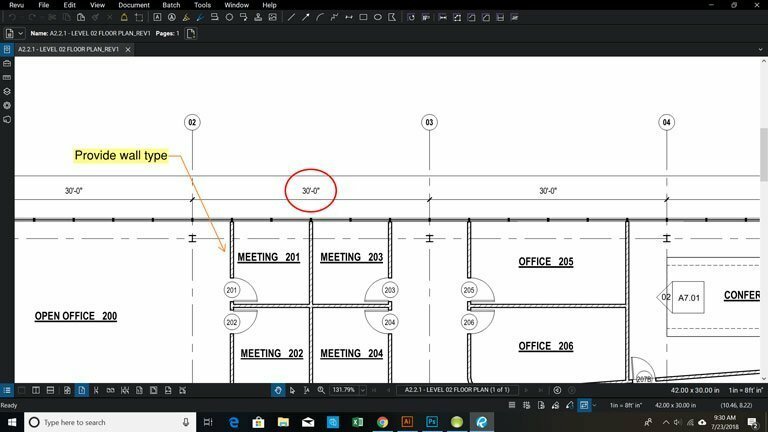 In this example I chose not mark a boundary where the doors open to show why you might want to use boundaries when taking an area measurement like this. If you are satisfied with the selection, click on apply in the Dynamic Fill toolbar. The green color will disappear and will be replaced by a red line on the perimeter of the space, with points determined by Dynamic Fill. The area of the space will also be calculated, based on your selection and the calibration you did earlier. In this case it happens to be 138,152 square feet. These options barely scratch the surface of what’s possible with the measurement tool. In future postings we will be sure to cover more options in detail and will explore many of the other possibilities Revu offers. Be sure to subscribe to our blog for more helpful tips and tricks, and please feel free to join the conversation by leaving comments and suggestions below.